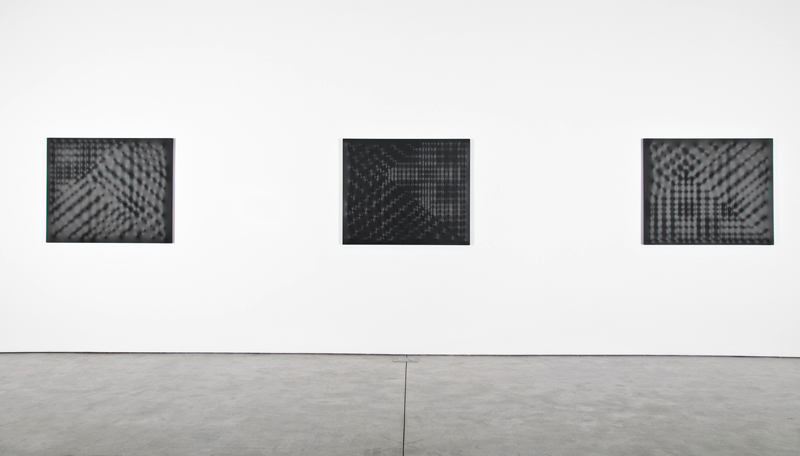 Castellani e Castellani was on view at Haunch of Venison in New York from November 11th, 2011-January 7th, 2012. The exhibit, organized by Emilio Steinberger, presented the artists most recent body of work titled Angolare along with Spazio Ambiente a paramount work dating from 1967-70, which was on loan in the gallery from it’s permanent home in the collection of Maria Teresa Venturini Fendi. The piece encompasses an entire room and was reinstalled specifically for this exhibition. 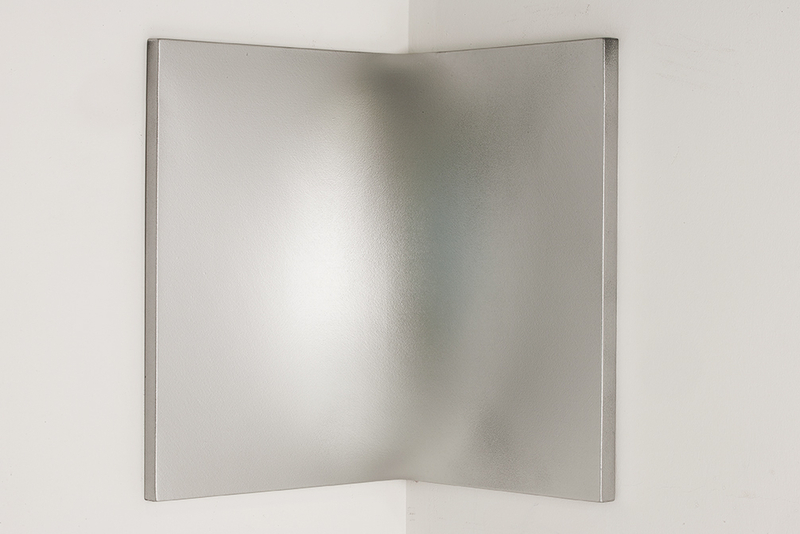 The title, Castellani e Castellani, allowed the artist to have a dialogue with himself. 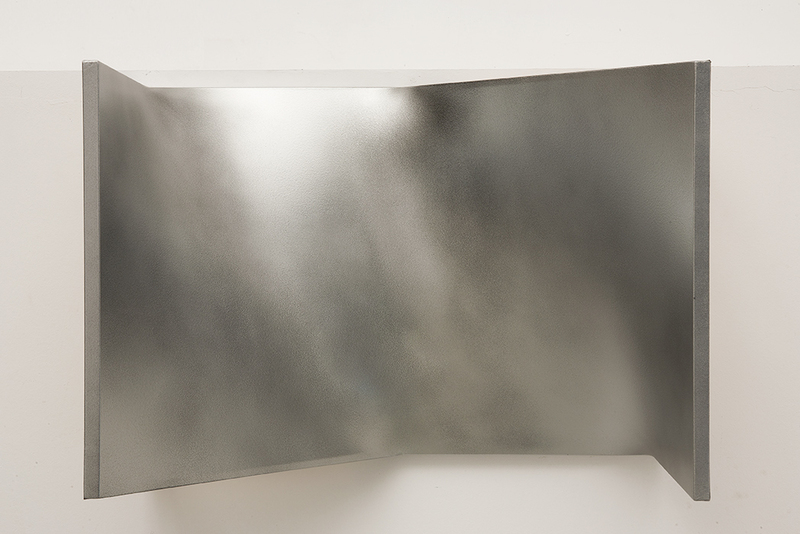 It’s as if he made a visual notation referencing his previous work and then in a similar yet different way remarked on his own sense of self, and space as he used a silver metallic paint on the surface of his new works; Angolare. The resulting surfaces bend and curve in seamless yet awkward positions attempting to insert themselves into gallery corners. Castellani succeeds in his aesthetic language which has remained consistent over the years in visual presence and textural mark making. Enrico Castellani, born 1930 in Castelmassa (Rovigo), Italy, is currently based in Celleno (Viterbo), Italy and still makes all of his artwork by hand. A large part of his practice relies on the facilitation of technique and a particular craft that he has fine-tuned over the years. During my visit and private tour with exhibition organizer and International Director of Haunch of Venison, New York Emilio Steinberger, I was invited to crouch down and peer underneath the contorted canvases in order to get a view into the way each piece had been constructed. To my pleasurable surprise, behind each canvas was a precise framing system which allowed for pressure specific warping and allowed the piece to remain in place. This moved the work I was looking at from a painterly position into the realm of sculpture. It is here where Castellani makes an important mark in the world of contemporary and international art. When looking at his work, it is obvious to recognize the temporal connection that he has with Italian artist Lucio Fontana, 1899-1968, most known for his slashed paintings. However, where Fontana was actually cutting into the surface as a dimensional draftsman, Castellani practices inversely making convex marks and shapes, based on structural interventions. While all of the work in the exhibition was similar visually and aesthetically, each piece relating to another as siblings in a family exterior, the true gem of the exhibition was Spazio Ambiente 1967/70. The work is part of the permanent collection of Maria Teresa Venturini Fendi and was re-installed at the New York Gallery specifically for Castellani e Castellani. Not often on view, it was a rare occassion to experience this ambient space made of canvas. The piece was made for “Lo Spazio dell’immagine” an exhibition which took place in the small Umbrian town of Foligno in 1967. Painted entirely in monochromatic acrylic, the canvases form “surface” of walls, and geometric shapes that when installed comments on traditional perspective and gives the viewer a new and uneasy relationship to interior. First titled Ambiente bianco the original work was destroyed where it had been installed in Palazzo Trinci for “Lo Spazio dell’imagine” due to its complexity and size which made the piece impossible to remove through the slender doorways of the Palazzo. Three years later, Castellani reconstructed the work which had gained notoriety, for another important exhibition in Italy, titled “Vitalita del negativo nell’arte italiana 1960/70” opening in Rome, 1970. At this time Ambiente bianco was renamed Spazio ambiente and retained the date of the original work in order to communicate with the initial earlier spatial conception. Over the years the white canvases have yellowed into a warm subtle vanilla color and faint cracks in the paint decorate the surface like time honored wrinkles. Spazio ambiente, was a relevant and important work in 1967/70 and is an important work today. With Castellani e Castellani on display, there was a lightness to the interior of Haunch of Venison, filled with natural daylight bouncing off the reflective and highlighting matte canvases. Everything felt remarkably fresh while also hinting to a time in our recent past, when an artistic goal was to remove, strip-down and minimally withdraw emotionality and representation. In turn, a focus was placed on space, a wall, a corner, an awkward twist, that was occupied by Enrico Castellani even if for a brief moment in New York, the works will remain significant in art historical terms, a notation in a movement of reductive, conceptual painting.